It’s always a little hard to give a thorough review to a casino when you spend only a couple of hours there. On the other hand, first impressions are powerful and often help gamers decide where they’ll play, and where they’ll return, amid multiple options. 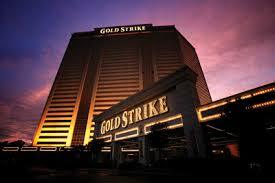 My visits to the Gold Strike and Horseshoe casinos in Tunica, Miss., were only for a couple of hours each. The two are next door to each other and an easy door-to-door walk. At the Horseshoe, part of the Total Rewards casino group, I was in a ‘big’ spend mood (for me!) and spent my first 15 to 20 minutes playing the $1 and 50-cent slots, before migrating to the quarter machines. I didn’t win and had very little back and forth, although while playing a 50-cent three-reel I was next to a woman whose $1.50 max bets yielded a nice $500+ payout. In general, I came up short at the Horseshoe and after nearly 45 minutes was down about $50 out of pocket, so I started to play a variety of penny and lower denomination games with fun bonus round options. An astrology-themed game was a smile starter and offered the give and take that makes gaming fun, and the 25-cent Wheel of Fortune started to pay out a bit, but ultimately went cold. Games that typically lead fairly easily to bonus rounds, like Hell’s Bells, teased with two of the three ‘dings’ needed to get to the bonus, so I eventually gave up. Often when the gaming is leading me along a ‘bad beat,’ I’ll try a few more slots randomly on my way out the door, just to see if my game choices and luck were just a bit off the mark, but even this last minute strategy resulted in more money lost. Gold Strike, the MGM resort where I stayed, had a nice feel about it, although I came into the casino after 11 p.m., needing a new M Life card, and was sent from the closed M Life desk to the cashier. The window cashier called a floor attendant, who arrived about 7 to 10 minutes later. He took my driver’s license and eventually came back with my player’s card. The whole process took 20 to 30 minutes, so a lot of wasted late-night time. Ironically, no one suggested I use one of the M Life card vending machines, which I discovered an hour or so later. I used it, just to try it, and totally loved the ease and convenience. Another nice feature of the Gold Strike is its non-smoking second floor. Although limited in its game selection, and appearing to be only about a quarter of the size of the downstairs gaming floor, it was great to escape into a pure-air environment. The floor also has its own bar, beverage station and table games, which you typically don’t see in non-smoking slot areas. After playing a few of the games in the tier circling the escalators, I went into the main room and sat a bank of slots to the side of the bar and just started winning – not huge amounts, but I won back most of what I lost next door at the Horseshoe, and stayed way longer than anticipated. I like the Tunica area as a gaming destination because it offers city-style gaming in a sprawling rural landscape. If you tire of the sometimes frenetic pace of the casino floor, all you need to do is step outside and enjoy the quiet darkness surrounding the bright lights. Smoke Ventilation A smoke free floor! Dan’s The Man in Detroit!